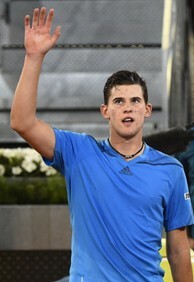 Dominic Thiem recorded the biggest win of his young career earlier this month, defeating world No. 3 Stanislas Wawrinka in Madrid. Throughout the year, EmiratesUSOpenSeries.com will feature players who could make an impact during this year's Series. Here’s a look at 20-year-old Dominic Thiem of Austria. The Breakdown: The youngest player currently ranked in the world’s Top 100, Thiem was the No. 2-ranked junior in 2011 and has wasted little time translating his junior success to the pros. He reached the quarterfinals of two ATP events last year, in Kitzbuhel and Vienna, both in his home country, but has been enjoying success across the globe in 2014. Thiem started the year by qualifying for his first Grand slam main draw at the Australian Open, where he won his opening-round match. He came through qualifying to reach the third round of the BNP Paribas Open in Indian Wells, then followed that up by qualifying again to reach the second round of the Sony Open in Miami. But the Austrian saved his best result so far this year for the clay season. At the ATP Masters Series event in Madrid, he knocked out world No. 3 and reigning Australian Open champion Stanislas Wawrinka in the second round. Thiem was forced to retire from his next match due to illness but nonetheless served notice that he’s a player to be reckoned with in the foreseeable future. The Baseline: A flashy all-court player with a one-handed backhand, Thiem is equally solid on both sides from the baseline. However, it’s his variety of shotmaking and on-court anticipation that has been most impressive to tennis critics. This tactical prowess is perhaps best enhanced on clay, which he considers his favorite surface, but his game translates well to hard courts as well. Thiem is planning to compete extensively this year in the Emirates Airline US Open Series. His current ranking of No. 61, up nearly 80 places spots since the start of 2014, will give him direct entry into most events. With minimal points to defend for the next two months, it's very likely he'll crack the Top 50 by the summer.